Godzilla is more than just some guy in a cheesy rubber suit terrorizing badly dubbed Japanese actors and stomping miniature cities. The original film, made in 1954, is actually a tragedy of epic proportions, a potent warning of an escalating nuclear arms race and messing with atomic power. Of course, Godzilla mainly works as an entertaining monster movie, too. When a 7,500 ton freighter is mysteriously lost in the South Seas off Japan, the authorities are baffled. Soon afterwards, a fishing boat is destroyed in the same manner: from an underwater explosion. It is a mine? An underwater volcano? There are only a few survivors and one of them claims to have seen a creature in the water. Some elderly citizens immediately claim that it was Godzilla, a creature that lives in the sea and occasionally surfaces to feed on mankind when food in the ocean is scarce. Sure enough, late one stormy night, something destroys several houses in a village in such a way that it could not have been the result of natural causes, like a hurricane. Director Ishiro Honda wisely prolongs the first actual appearance of Godzilla for 21 minutes, cleverly employing traditional horror film techniques to create tension and build anticipation. We never actually see the monster in the initial attacks – just a hint of him but nevertheless his presence looms large, much like with King Kong (1933). When we finally do catch a good glimpse of the creature, it is little more than a head but it is a fantastic shot that effectively establishes his massive scale and is more than enough to send the locals running for their lives. The country’s leading scientist Professor Yamane (Shimura) theorizes that Godzilla is the result of atomic testing, a mutation that exists to punish his country for dabbling in the dangerous waters of atomic energy and radiation. Naturally, the Japanese government wants to destroy Godzilla but Yamane respects the beast and wants to study it. Yamane represents a sobering humanistic voice that mirrored Honda’s own beliefs and acts as a sharp contrast to the government’s foolhardy shoot first, ask questions later attitude. 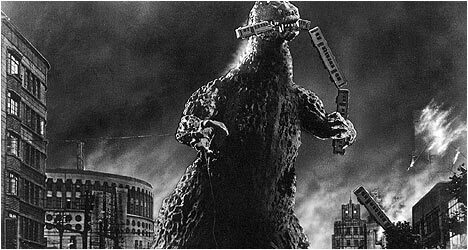 Look past the guy in the rubber suit and the obvious miniatures and you’ve got atmospheric black and white cinematography by Masao Tamai that is haunting, especially the night scenes with an almost silhouetted Godzilla destroying Tokyo that is a devastating site to behold. Godzilla was born from the ashes of A-bomb attacks on Hiroshima and Nagasaki – the fallout of which Honda witnessed first hand. In fact, the film’s opening scene, where a freighter is destroyed by an explosion from under the water, was a reference to an incident in which a tuna trawler got too close to an H-bomb test courtesy of the United States and its crew became sick with radiation poisoning. With this knowledge, it’s hard not to see Godzilla’s swath of destruction through urban Japan as a metaphor for the A-bomb and a powerful critique of the dangers of atomic radiation. This is what elevates Godzilla above countless other monster movies from the 1950’s and has inspired countless sequels that have transformed the giant monster into a pop culture icon. The Japanese version is the way this film was meant to be seen with all of the stark footage of the dead, maimed and shell-shocked and numerous the A-bomb references – something that is missing from subsequent sequels that have turned into admittedly entertaining battle royales. A few years ago, Classic Media released an excellent special edition of Godzilla with an unimpressive transfer and a decent collection of supplemental material, none of which has been carried over to the Criterion Collection’s new and improved edition so completists may want to hold onto that previous incarnation. As you would expect, Criterion’s transfer is near flawless and a significant improvement on the Classic Media version, making it more than worth the upgrade. The first disc features an audio commentary by film historian David Kalat who provides a nice mix of analysis and production information. He goes into great detail examining the relationships between the characters and their purpose in the film. Kalat also touches upon the difference between the Japanese and American names for Godzilla. He also good-naturedly addresses the absurdity of the oxygen destroyer and other scientific inaccuracies. At times, he comes across as a little too enthusiastic but this is tempered by his encyclopedia knowledge of all things Godzilla. “Photographic Effects” features effects director Kawakita and effects photographer Motoyoshi Tomioka revealing how some of the special effects for Godzilla were done with examples from unused footage. They point out the extensive use of matte paintings and composite shots. Japanese film critic Tadao Sato examines Godzilla’s role in Japanese culture. He remembers seeing the film when it first came out and recalls his first impressions. He also points out how aspects of the film evoked memories of the atomic bomb attacks on Japan. “The Unluckiest Dragon” is a 2011 audio essay about the Daigo Fukuryu Maru fishing boat tragedy that inspired parts of Godzilla. The crew witnessed a powerful U.S. atomic bomb test and became sick with radiation poisoning. This essay examines the socio-political implications of the incident. For completists, both versions – the original 98 minute Japanese version and the 80 minute Hollywood version, entitled Godzilla, King of the Monsters – are included, each on their own disc, but after seeing the original it is really hard to go back to the other. American movie producers acquired the North American rights and promptly Americanized the movie, inserting a reporter played by Raymond Burr with only 60 minutes of the original film intact, the rest was cut and new footage shot. Criterion has also included a trailer and David Kalat returns for a commentary where he starts off by providing the brief backstory to the nuclear arms race between Russia and the U.S. He discusses the Americanization of Godzilla including its unusual structure of flashbacks, which he explains may actually be reminiscent of film noir. There is an interview with actor Akira Takarada who talks about his experience working on Godzilla. He talks about his initial impressions of the screenplay and tells several filming anecdotes, including working with the legendary Takashi Shimura (The Seven Samurai). Godzilla performer Haruo Nakajima (who played the creature in 12 films) talks about the challenges he faced playing the iconic monster. He recalls being told to study King Kong for how to move like a mythical creature. He talks about what it was like moving inside the suit and how he had to adjust his performance. Features effects technicians Yoshio Irie and Eizo Kaimai talk about their work on the film. They start at the project’s origins and go all the way through production providing invaluable recollections on how the various effects were achieved. Composer Akira Ifukube talks about his long, illustrious career and, of course, his groundbreaking work on Godzilla. He talks about his humble beginnings in forestry to how he eventually got involved in scoring films.